HEAD: Dead weight on an airplane. When I first started flying twelve years ago, I had a roomie from Florida, a real life pageant queen named Suzette. If I had to describe Suzette in one word, I’d have to use the word fabulous, and that would be fabulous with a capital F, Maybe even FABULOSO, she was that amazing. Everyone loved Suzette, passengers and crew alike. What wasn’t to like! Sweet, funny, smart, and beautiful with big brown hair, full red lips, creamy white skin, and the biggest bluest eyes you’ve ever seen, she was the perfect flight attendant. The thing I remember most about Suzette, besides the way she used the word “fixin,” as in I’m fixin to make a sandwich, or the day she quit flying (after she caught her boyfriend cheating, naked woman in the closet and all), was the time she told me about the dead body. Yep, Suzette saw something her first month of flying I have yet to see in my entire flying career, a dead body on a flight. And that body didn’t die IN flight. Oh no, that body came on the aircraft already dead. In a wheel chair. Pushed by the wife of the one who’d passed. Honestly, I wouldn’t joke around about something as serious as this. 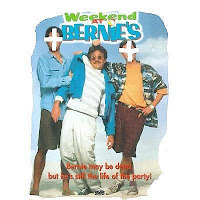 It was like a real life WEEKEND AT BERNIES. “I swear, ya’ll, I knew that man was dead the minute I saw him,” explained Suzette. She was in her blue and white pj’s, the ones with the clouds all over them, sitting cross legged on one of the twelve beds that lined the walls of our trash pad, I mean crash pad. These days, I’d believe just about anything, considering I’ve seen it all flying the not so friendly skies. But back then, I was new, fresh from the charm farm, and to say I was shocked is putting it mildly. We all were. We, being the twelve of us who lived in that teeny tiny one bedroom apartment in Crew Gardens, also known as Kew Gardens, which is in Queens. “I’m not kidding, ya’ll!” Suzette exclaimed, something she said more than once. Then she went on to tell us that halfway through the flight the man was officially declared dead and the flight was diverted so the body could be removed. Not long after that I heard another crazy story, but this one was about a passenger out of Miami who tried to transport a dead body inside a hanging garment bag. I’m not kidding. While I don’t have details, I can imagine the passenger asking “May I?” while holding up an over-sized garment bag to the flight attendant standing in front of the closet door greeting passengers in first class. Dead bodies are on lots of flights — especially flights departing from retirement areas. The cargo compartments are designed to hold them, and they usually go in the non-heated compartment.The body is usually loaded in a coffin, and the coffin is strapped to a pallet that’s encased in white cardboard — you would never know by looking at it, what it was. You’d just think it was a big piece of freight.The only thing it says, on one end of the box, is ‘head’ — all cargo compartments slope from the tail downward, and the instructions they give us are to keep the head elevated and the feet lower.If you see a box with the word ‘head’ on it, for sure — that’s a body. HEAD – it’s the word of the day, and all I’ve got to say.